Marlon Brando was, arguably, the greatest American actor of the twentieth century. 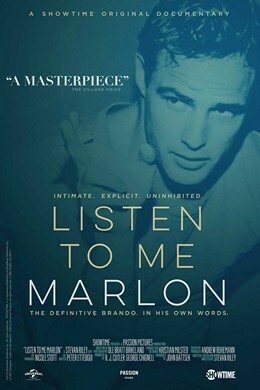 Stevan Riley’s new film, Listen to Me Marlon is a deeply moving examination of Brando’s tragic life and work. Based on taped musings that Brando left behind after his death, it is actually more of a film essay than a documentary. Brando’s tapings are combined with clips from his films, excerpts from TV news broadcasts and interviews, and even messages from Brando’s telephone answering machine, to create a tapestry of ideas, opinions, reflections, and emotions that is deeply haunting and even somewhat disturbing. We learn about Brando’s childhood in Omaha, Nebraska. He talks about his abusive father and alcoholic mother. His father sent him to a military academy, an experience that left him with a deep dislike for the military, whose purpose he saw was to make men into machines. After he dropped out of the academy, he went to New York, where he studied acting under Stella Adler. He immediately showed a strong talent for it, and Adler encouraged him to pursue a career in theater. He achieved success early on when he was cast as Stanley Kowalski in Tennessee Williams’s A Streetcar Named Desire. However, he found the role emotionally demanding. (He says the character reminded him of his father.) Performing this play night after night left him feeling drained. He decided then he would only do film acting. He achieved enormous success doing this during the 1950’s. However, he found the experience of filming the 1962 film, Mutiny on the Bounty unpleasant, and he was hurt by the fact that the studio blamed him for the film’s delays and cost overruns. Embittered by this experience, Brando began to view acting as nothing more than a way to make a living. Making The Godfather reawakened his enthusiasm for acting. However, after Last Tango in Paris, he came to feel that the director, Bernardo Bertolucci, had invaded his privacy. Apocalypse Now was something of a repeat of Bounty for Brando. The director, Francis Ford Coppola, blamed him for the film’s cost overruns. After that, Brando says little on the topic of acting or the films he appeared in. Brando talks a great deal about his love for Tahiti, both for its landscape and for its people. Brando tells us he only ever felt at peace among Tahitians. He also talks about his involvement in the civil rights movement, as well as for his support for the struggles of Native Americans. The final section of the film largely deals with the tragic events that culminated in the suicide of his daughter, Cheyenne. Listen to Me Marlon is a stunning depiction of the life of an extraordinary man.